The heat wave hanging heavy over North America this past week is just one of thousands of manifestations of climate change. We see other signs in blistering droughts, more violent hurricanes, destructive wildfires, and rising sea levels. Some 25% of the world’s animal species face extinction. Climate change threatens the world’s food supply, turning fertile land into dust bowls and deserts, triggering deluges, and reducing the yields of staple grains. If we don’t act quickly, millions of more people will be subjected to terrible food shortages, malnutrition, and even starvation. To avert the worst imaginable consequences, incremental measures are not enough. We need to make an all-out effort to shift away from polluting and destructive fossil fuels and adopt clean renewable sources of energy. Millions of people around the country, and hundreds of millions around the world, have recognized the danger and are demanding a rapid and total transition in our energy systems. 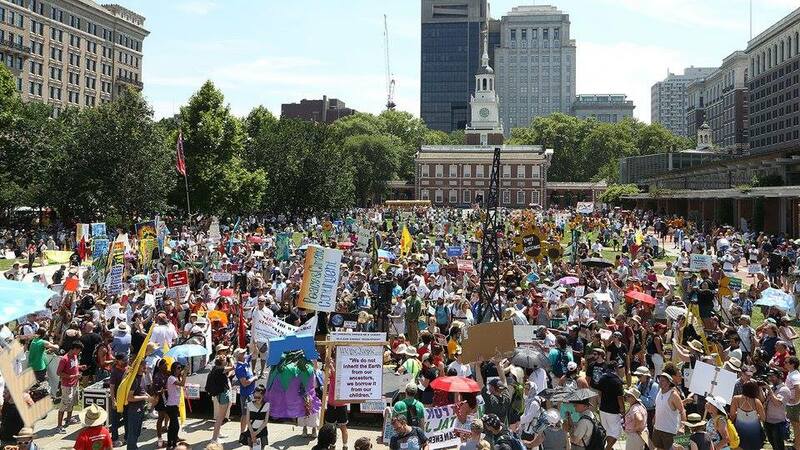 The march was but one expression of concern about the climate, one that brought together people from all around the country—I met some even from California—to voice their aspirations for a sustainable world by walking together through the streets of Philadelphia, starting from City Hall and ending at Independence Square. An interfaith service in the inner court at City Hall preceded the actual march. The service began with a smudging ritual and invocation by members of the Lenape Native Community. This was followed by short presentations (all under five minutes) by representatives of Judaism, Islam, and Christianity. 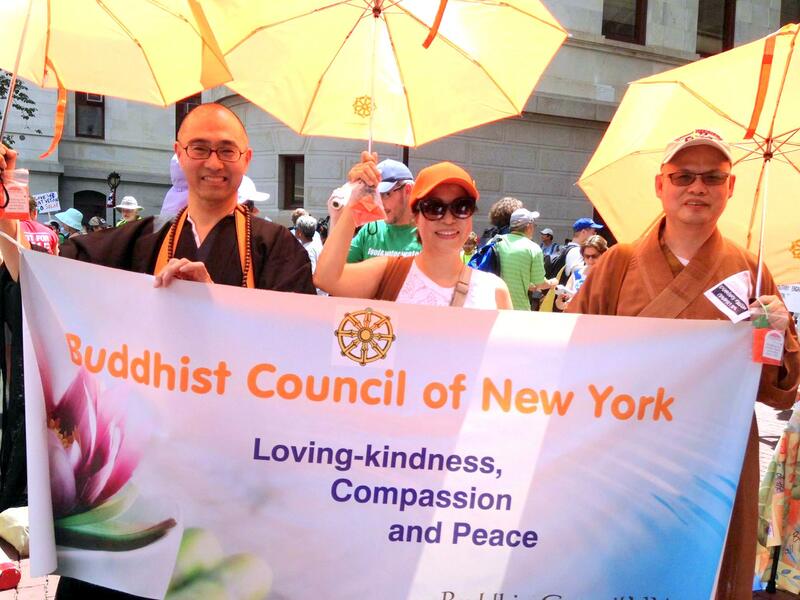 I was privileged to be the Buddhist representative at the service. Here is the text of my prepared remarks. A video of my presentation is here. Since I spoke extemporaneously, my actual words were a little different from the prepared text. First, visualize as if from space a heat map of the earth as it might have looked in the 19th century, with prevalence of blue and green bands. Then visualize a heat map of the earth as it is today, with increasing bands of yellow, orange, and red. Now let us focus in on real life situations on the earth, among those most badly affected by climate change. In each case, do not merely think about these communities, but bodily identify with each one, as if you are that person. (1) You are a child in a family of small-scale farmers in Senegal. The land is parched and barren, livestock are dying. Your parents decide to migrate to Europe. You leave behind everything you know and travel overland to the Mediterranean Sea, risking your lives to cross the sea. You look back at the land you are leaving behind—your home country, all your relatives, all your memories—and look ahead at the sea before you, facing an uncertain future. (2) You are a farmer in India. The monsoon rains have failed this year. The rivers run thin, as the glaciers have been shrinking due to the rise in temperature. There is insufficient water to irrigate your crops. You are heavily in debt. You look at the can of insecticide. You have a wife and four kids to support, but your situation is unendurable. You wonder: Is this the only escape route? (3) You are the parent of two children in the Philippines. It’s a nice day and your children went our to play on the beach. Suddenly a typhoon arrives, fierce and powerful, and sweeps over the entire village. You look out from your porch, and see your children bewildered as the waves rise higher and crash down on them. Then, helplessly, you see your children being swept off by the flood. (4) You live in a nice house in a quiet rural community in Pennsylvania. Life has been uneventful here for years, but just a few weeks ago some trucks arrived, bringing heavy equipment. A line of natural gas has been discovered beneath the shale formations a few miles away, and now each day there is the rumbling noise of trucks. Before long, you hear blasting noise and a natural gas well rises on the horizon. After a few months, the noise and odor become intolerable and the water from your well has started to take on a strange benzene-like taste. 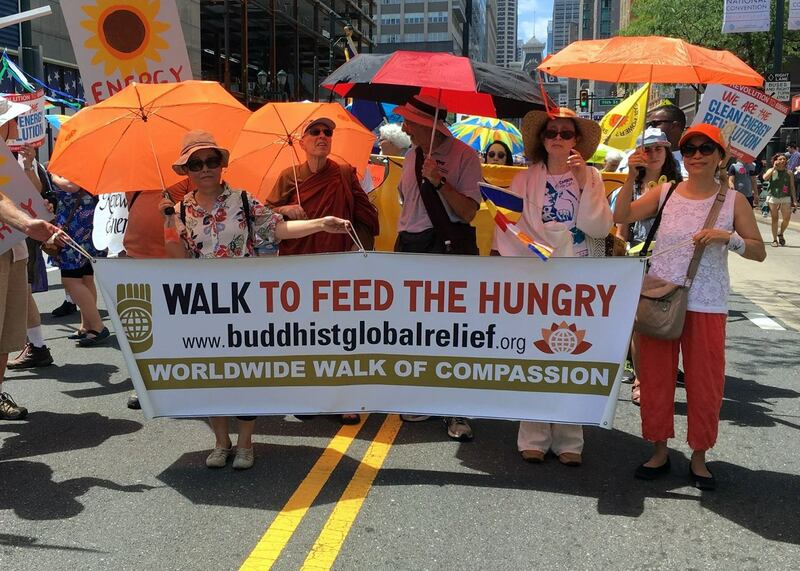 This entry was posted in Buddhist social ethics, Climate change, Engaged Buddhism, Interfaith action, News item, Social justice and tagged Bhikkhu Bodhi, Climate change, Engaged Buddhism, Global warming, Interfaith action. Bookmark the permalink.